A dedicated product for Music Stations, Music Groups, Nightlife, Party, DJs, Clubs, Bands and Gigs. It helps building a complete website where albums can be uploaded all together or tracks one by one. Allow free download and make tracks commercial by adding BUY NOW option for audio/ video tracks. Add music according to category like Pop, Rock, Classical, Jazz etc. Manage Gallery, Events or Albums with as few clicks as possible through elegant page builder. Theme options set you free to handle all things like sidebar, sliders and everything relevant easily. Atom Music is fully responsive beautifully designed word press theme. 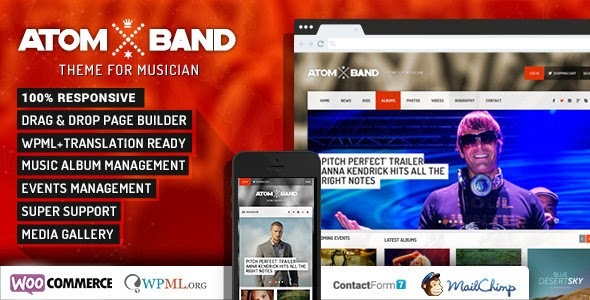 Item Reviewed: AtomBand Responsive Dj Events & Music Theme 9 out of 10 based on 10 ratings. 9 user reviews.